Think of a triangle, with a town and its castle at each of the points. There’s a river on two of the three sides, but the third side drifts so openly toward the marshes of the south and the sea that the delta might as well be an island. Across the center of the triangle, almost due east to west, runs a jagged chain of sharp cliffs and steep valleys known as the Little Alps. In actuality, they look more like an Impressionist version of the mountainsides of ancient Greece, shrunken to a more human scale, and placed like a stage set in the middle of a rocky plain. The legends began six thousand years ago when the Neolithic hunters formed small communities in the safety of the mountain-top caves and springs at Les Baux and Eygaliere. Around three thousand years ago, a proto-Celtic civilization developed, one which welcomed the Greek traders who arrived half a millennium later in the 6th century BCE. Three hundred or so years later when Rome arrived in the first flush of its empire building, the Ligurians were cultured philosophers who had dwelt in peace so long they had virtually forgotten the art of war. Rome saved them from the more nomadic Celts sweeping down from the north, but at the price of their independence. The Salian confederation of Ligurian tribes was defeated by the Romans within a generation and soon thereafter the entire region was annexed as Rome’s first province, the Provincia Narbonenis. A century later, Augustus and Julius having made safe the roads back to Rome – and in doing so made Celtic Gaul Roman – the first province, Provence, became the centerpiece of the transalpine empire. Nestled in a narrow valley to the north of the Ligurians’ sacred mountain stood the ancient capital of Liguria, the Celto-Greek city of Glanon, Romanized as Glanum Livii. 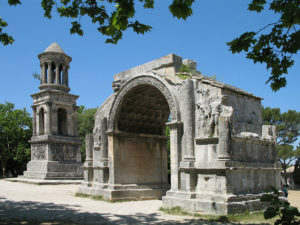 Founded half a millennium before the turn of the common era, Glanum’s authority depended on its closeness with the Druidic priesthood at Les Baux and in the Valley of the Ancients at Cordes. In the Roman era, it was eclipsed by Arelate (Arles), which had wisely backed Julius Caesar in his dispute with Pompey in 49 BCE. 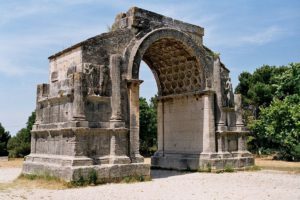 Even as Arelate grew, Glanum adhered to its old ways, absorbing first the Romans, and then in the middle of the first century CE, an influx of Jews from Palestine and other parts of the new Roman Empire. Some of these Jews were followers of a rabble-rousing magician, Jesus the Nazorean, who had just claimed the ancient throne of David in Jerusalem, and been executed for treason by the Romans for the attempted restoration of the ancient lineage. The fleeing followers included, perhaps, members of Jesus’ immediate family. As they spread throughout the region preaching their Gospel, the cultured and thoroughly Helenized Druid philosophers were also converted to the new faith. From this unique blend of spiritual influences would grow an alternative version of what, a century or two later, would be called Christianity. 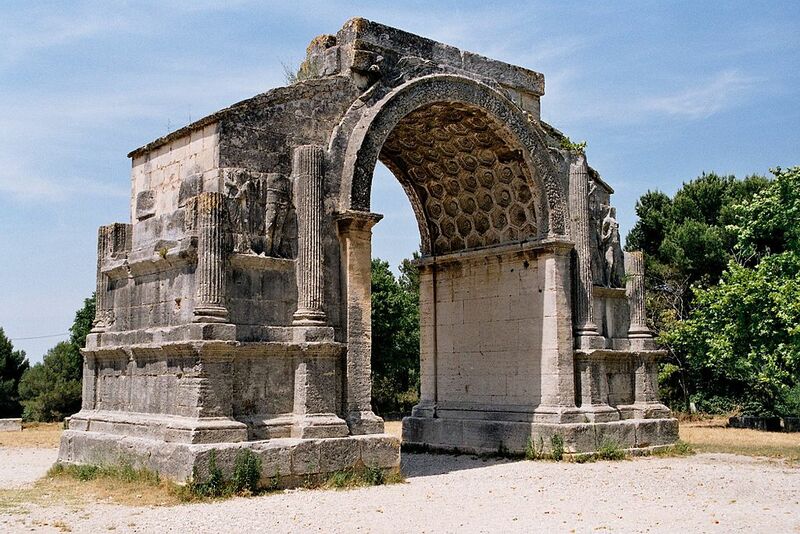 During the campaign, Clovis traveled the ancient Roman road from Arelate to Avenio (Avignon) and camped with his army in the fields north of the ruins of Glanum, around what would come to be called Les Antiques. While camped at Glanum, Clovis experienced a miraculous visitation from his mentor, St. Remy, who prophesied for Clovis the future of his dynasty -”The Kingdom of France is predestined by God for the defense of the… only true Church of Christ. This kingdom shall one day be great among the kingdoms of the earth…” – as well as his personal future – “At the end of his most glorious reign, he shall go to Jerusalem, and shall lay down his Crown and Scepter on the Mount of Olives…” Clovis was so impressed by this experience that he gave the entire area to the church of Rheims, and so the new hamlet that grew on the site was called St. Remy’s town. 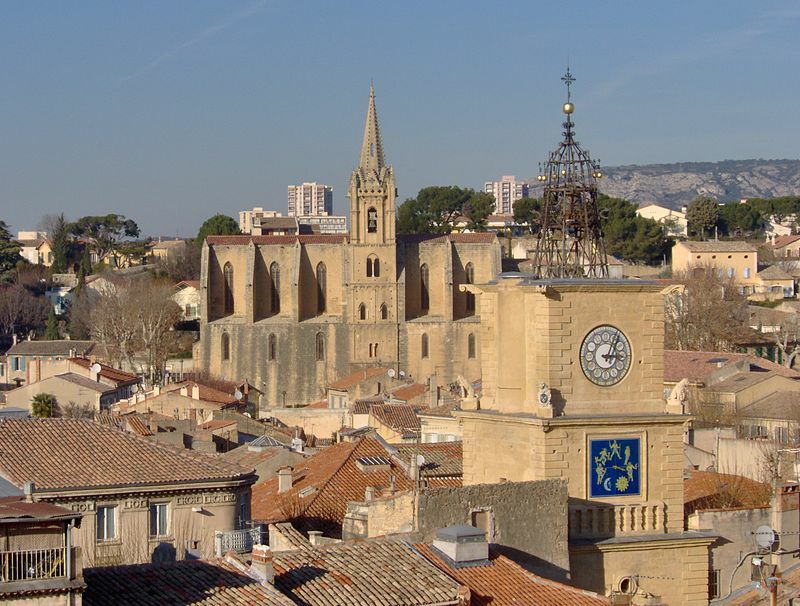 Clovis went on to become the greatest of the Merovingian Kings, and St. Remy-de-Provence remained ever after woven into the sacred tradition of French kingship. The fortified hilltop villages, such as Eygaliere, fared better in the next few centuries than did the new towns such as St. Remy. Hit hard by the plagues of the sixth century and the Arab invasion of the eighth, a small measure of stability returned to the region with the rise of the Carolingians. The area around St. Remy became virtually independent as a kind of Dark Age city state, and survived in this form until the rise of the Lords of les Baux in the middle of the tenth century CE. Around 950, a local nobleman named Hughes claimed by right of descent, the ancient lineage once again, the old Roman watchtower and Druidic observatory at the entrance to the Valley of the Ancients at Cordes, directly in the center of the Alpilles. Perched like a vast boat – hence the name les Baux, the beam or keel of a ship that would in local usage come to mean any sharp uprising of rock – floating to the south of the sacred mountains, the terrace has an unobstructed view of the entire southern horizon, making it possibly the most significant Neolithic and megalithic astronomical location in all of Europe. Militarily, the site commanded both the Roman road to the north, through the passes it looms above, and the east/west road across the Crau, which ran directly below the rocky fortress. Possession of this site made Hughes and his descendants the masters of the medieval empire of the sun. 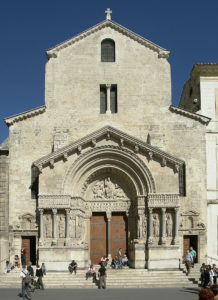 The Lords of les Baux adopted the idea of a semi-divine lineage, proclaimed by Clovis after his vision at St. Remy, and combined it with the ancient local traditions of Druidic astronomers to produce what to their contemporaries was the odd idea that they were descended from the third wise man, Balthazar. But from within the local mythic context, this was the only description possible for a tradition that clearly preceded Christianity, even as it recognized and embraced it. Of course the Druids of the Valley of the Ancients had foreseen the new age in the sky, so why shouldn’t they have sent a wiseman, a magi, in search of the meaning of the Star? The Lords of les Baux took the mythic Star, shown with 16 rays, as their family crest. 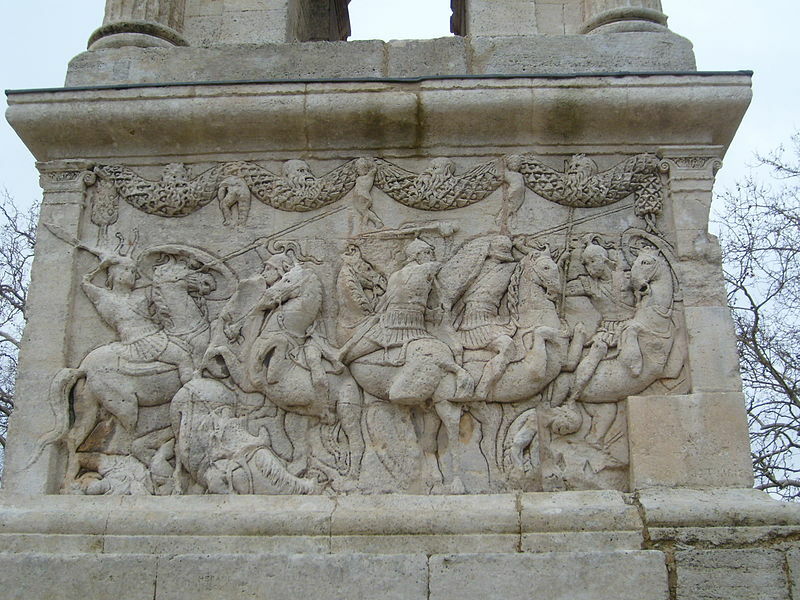 At the height of their power and influence, the Lords of les Baux ruled roughly one hundred villages and hilltop keeps on both sides of the Alpilles and by the late twelfth century had taken on a role in international power politics. Their support encouraged Frederick I Barbarossa in his end-run around the Roman church, resulting in his 1179 coronation as King of Arles. 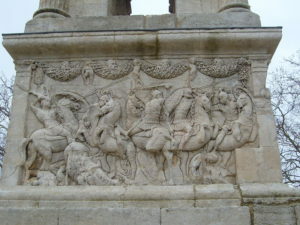 The facade of St. Trophime in Arles, designed and sculpted for the occasion, has a frieze depicting the entire story of the Magi as a direct nod to the influence of the Lords of les Baux. It was also the time of the Troubadours, who sang at the courts of love held in Les Baux, Romanin and Roquemartine, and the Cathar heresy, which the Lords of les Baux embraced, as well as the first appearance in written form of the Kabbalah, the transcendent light mysticism of the Jews, whom the Lords of les Baux held as being under their direct protection. The troubadour cited as the source for the original Grail legend by both Chretein de Troyes and Wolfram von Eschenbach, one Guyot de Provence, was a vassal of the Lords of les Baux, and it is therefore not unusual to find images and motifs from the Grail Romances springing to mind as one contemplates the fortress of Les Baux. Within a generation, all would be on the verge of ruin, as first the Pope and then the French King launched crusades against the heretics of the south. After invasion and inquisition came the first waves of the Black Death, and the Lordship of les Baux passed to the Counts of Provence. In the fifteenth century, this was Good King Rene D’Anjou, who gave Les Baux to his second wife, the beloved Queen Jeanne. It is fitting that in its final days of independence, Les Baux was ruled by a Queen. After her death, King Louis XI of France destroyed the fortifications, but Les Baux continued to be an important fiefdom. In the sixteenth century, it passed to the Marechal of France, Anne de Montmorency. With the good Marechal, we arrive in the time of the region’s most famous historical figure, Michel de nostra domina, nicknamed Nostradamus by his contemporary, Francois Rabelais. The sixteenth century was a crucial point in the history of France and Europe, and Nostradamus was part of all the conspiracies and diverse intellectual currents of the era. Within his lifetime, his influence would begin to shape the events of European power politics, and after his death his shadow would continue to haunt the future, touching even our own more rational age. Michel, eldest son of Jaume de nostra domina, a local grain merchant and notary, was born in mid December 1503 in his grandmother house on the Rue Hoche, the main street of the ancient Jewish section of St. Remy-de-Provence. He spent his first fifteen years in St. Remy, playing in the shadow of Les Antiques and absorbing the region’s legends and history from his two grandfathers. 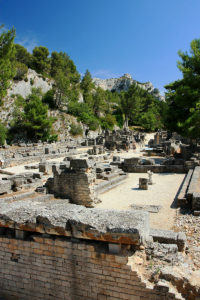 At that period, Glanum was a legendary memory, but one that was accessible to the adventurous. The crypt of the small chapel of St. Jean, a few hundred yards from Les Antiques, opened on to the ancient buried temple of the Goddess of the spring, the nympheum, of Glanum. And from there, miles of underground water chambers and sewers were available, running from Glanum and the monastery of St. Paul de Mausole out to the ancient quarries and beyond. His youth in St. Remy, with its mixture of myths and ancient history, had a profound effect on the future Seer of Provence. In six quatrains of his famous Prophecies, he returned to the scenes of his youth, implying that a great secret, the local myth of the “Silver Goat,” would be discovered there one day. 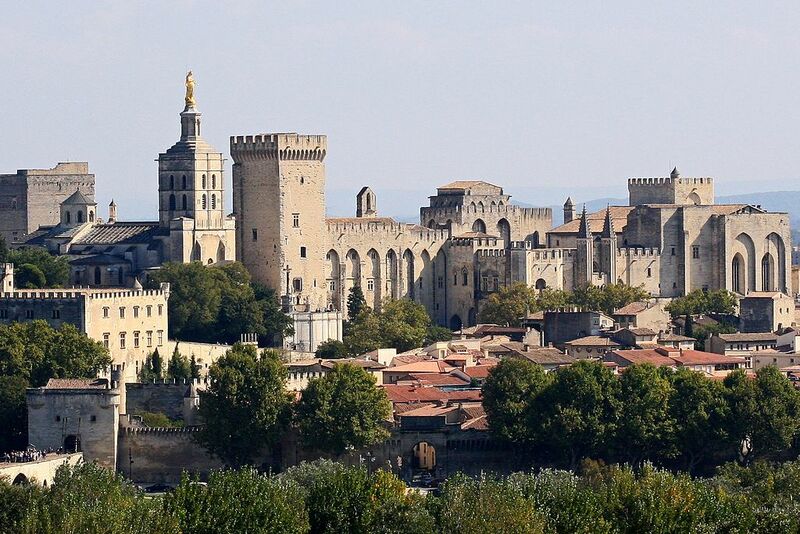 At fifteen, young Michel departed for the university school at Avignon, the scene of the French Captivity of the Church in the fourteenth century and still the center of the region’s intellectual life in the sixteenth century. In September 1521, his studies interrupted by an outbreak of the plague, Michel left Avignon and began his first period of wandering. By 1529, he was in Montpelier where he applied for admission to the medical school. One of his fellow students, the already famous humanist Francois Rabelais, Latinized Michel’s surname as Nostradamus. It is not clear whether Nostradamus ever received his doctorate, but by the early 1530s he had settled in Agen, in southwestern France, in order to study with the Italian humanist Julius Ceasar Scaliger. Nostradamus married a local girl, and quickly had two children. But disaster soon struck, and both his new wife and their two children died of the plague. By 1534, Nostradamus was on the move again. For a decade, Nostradamus wandered the south of France, from Provence to the Basque coast and Bordeaux and back again. By 1544, we find a contemporary mention of him studying the plague and its treatment with Louis Serres in Marseilles, and then, a year or so later, he was summoned to Aix and Salon to organize the fight against the plague. He was so successful that the next year he was called to Lyon for the same reason. These exploits made him well-known, and along with the division of father’s estate, he found himself wealthy enough to married the most eligible young widow in Salon-de-Provence, Anne Ponsard. But before he could settle down to wedded bliss, Nostradamus found it necessary to make a trip to Italy. Of all of Nostradamus’ mysterious periods of wanderlust, this last journey to Italy is perhaps the most odd. He married Anne, bought and began to refurbish a house in Salon, and then left for a two-year excursion. It is hard not to consider that he was in some way summoned to Italy, or at least compelled by reasons more powerful than just gathering recipes for his book on cosmetics. His old friend Rabelais was in Italy, and may have been the source of the invitation. Nostradamus alludes in his later works to collecting a number of volumes on occult philosophy during his trip that would later serve as the source of his magickal practices. Soon after the election of Pope Julius III in 1550, Nostradamus returned to Salon-de-Provence and began the work that would make him famous for the next half a millennium. Nostradamus was famous almost from the moment of his return, becoming a sixteenth century superstar within the decade when his prediction of Henri II’s death came true. Before his death in 1566, he was the confident of the Queen of France, and officially proclaimed the royal Councilor and Physician in Ordinary to the Crown. He charted the future of French Kings, Henri II and his sons, discovered the founder of the next dynasty, the ten-year old Henri de Bearn, recognized a future Pope, and composed a history of mankind’s possible and alternate futures in the Green Language of the Hermetic adept. And he accomplished all this without having his work placed on the newly developed Index of prohibited books, or even running afoul of the Inquisition. That alone shows that Nostradamus had many friends in powerful places. Whatever we make of his prophecies, there can be no doubt that they have continued to fascinate us. Each era has seen the reflection of its own time and problems in Nostradamus’ enigmatic verses, but he was right enough, often enough, with his predictions that our fascination is warranted. From a historical perspective, we can see Nostradamus as part of a reformation movement, not just within the church or the state, but an attempt to chart out the reformation of the human spirit through the vehicle of time. Nostradamus saw himself in the larger tradition of the Old Testament prophets and others such as the Sybils of ancient Rome and the more recent Joachim of Flores. But, and here’s the important twist, he also saw himself as a man of the renaissance, a man of science, pragmatic and empirical. His prophetic abilities were to him a kind of future science, known to the ancients, dimly reconstructed by the scholars of his era, but surely to be perfected sometime in the long reach of human history. In that sense, we can see his Prophecies as an attempt to communicate not just across time, but across levels of awareness as well. The mystery of Nostradamus is ultimately the mystery of the region itself, the ancient empire of the Sun. 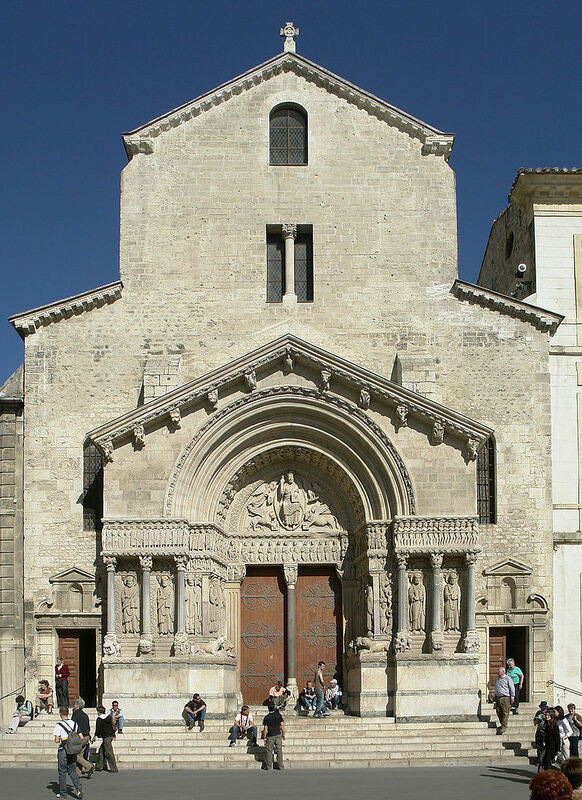 From the Druid Seers of Les Baux, the philosophers and early Christians of Glanum, to the Merovingians origins of St. Remy, the Magi of Les Baux, the Cathars, the Kabbalah, the Templars and the legends of the Grail, Nostradamus’ vision rested on a solid basis of local myth and tradition. 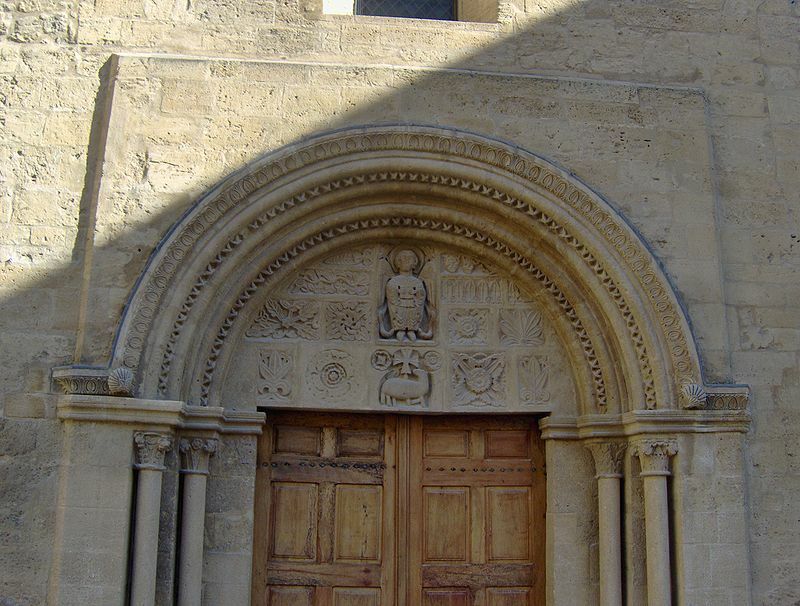 For example, just out Nostradamus’ back door in Salon-de-Provence, where he would have to have seen it everyday, is the Eglise St. Michel-de-Apocaylpse. 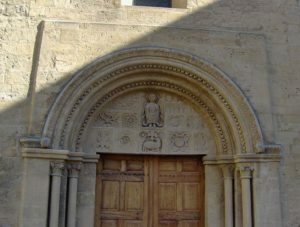 On its arched tympanum we find not just St. Michel holding the sealed book of esoteric knowledge, but also posing as Ophiucus, the serpent holding esoteric 13th sign of the zodiac marking the center of the galaxy. Below his central figure is a lamb and shofar horn, the horn of judgment, beneath a Templar cross. Around these central figures are “Green” language images of the Tree of Life along with the Merovingian fleur-de-lis. Nostradamus had but to take a walk in the evening to contemplate, on one church front, the deepest core of his philosophy.